This 7 mile circular walk covers a delightful area of Warwickshire countryside crossing fairly flat farmland, some woodland and quiet lanes. The walk incorporates a section of the Millennium Way, where you will be guided by the distinctive black Millennium Way way markers. Find out more about the walk by clicking on the information icon. Our walk starts from The Hickory Smoke House in Burton Green. With your back to the pub cross over road and go left for a few yards to find a footpath on your right. Go down this narrow track with fence left and follow to end of track into field. Stay forward with wire fences on left and on reaching the hedge continue right along narrow track to go through kissing gate at end of track and take further kissing gate a few yards ahead into a field. A lovely panoramic view unfolds ahead. Stay forward gently down field keeping hedge right. After some 150 yards there is a prominent way marker post pointing to a gap in the hedge on the right. Go through the gap then go left through kissing gate into field. Turn right keeping hedge right. Stay along edge of this large field keeping hedge right. At field corner take kissing gate into next field and go diagonally 1/2 right aiming towards a far solitary way post then continue on to near field corner to reach another yellow topped way post. Take footbridge over ditch then stay ahead with hedge right to take kissing gate into next field. Continue forward keeping wood right. 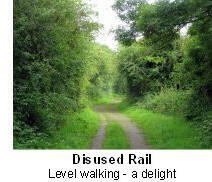 At the field corner go through kissing gate and take steps up to disused railway line. Cross over and take further steps down into woodland to take plank bridge over ditch into large field. Turn right here and continue along edge of field with trees right. On reaching road via wide gated gap, cross over and go right to reach a T-Junction. Turn left here into Hob Lane and continue on past Burton Green Primary School. After a further 200yards or so where the road bends gently right, go left by the way mark sign following the route named Birmingham Road. (Ignore the footpath on right) Stay along private drive and just before a white house named "Stile End" take a gated gap on left and then a kissing gate into field. Stay directly forward here taking the right hand footpath and keeping close to trees on your right. Take kissing gate in corner of field and stay on same heading to reach field corner with stile and adjacent gap.Take the gap into next field then go 1/2 left diagonally across field. Keep going diagonally across this very large field aiming in the distance for the gap between the second and third pylons from the left. 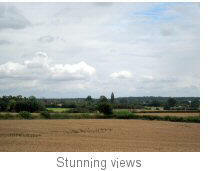 Eventfully you will reach a gated footbridge approx 80 yards in from the left corner of field. Take the double gated footbridge then go left to pass double power poles through gap into another field. Continue along line of power lines with hedge right to take kissing gate to main road. 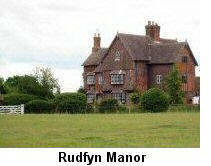 Cross directly over main road and continue up driveway of Rudfyn Manor signed Meer End 1 mile. Just a few yards after passing large pylon on left and under power lines you will reach a driveway on your left. Here we have reached the point where we join The Millennium Way. Opposite the driveway we turn directly right to cross a field passing 10 yards to the left of a large solitary oak tree. Stay ahead across centre of field aiming for a yellow topped way post by field corner edge where you will notice a distinctive black Millennium Way way marker. Follow the way marker slightly right then after 10 paces take gap left and immediately right to stay up field with hedge right. Follow around field edge up field to far mid hedge stile. Take stile and go over ditch bridge and second stile. Go across centre of next field to far right corner to find way marker and kissing gates. Take both kissing gates and go ahead with hedge right to find and take a metal kissing gate right. Go ahead over centre of field and take gateway to main road. Cross over main road and turn left, then almost immediately right take stile into tree lined copse to field. Go with hedge left then take corner kissing gate and go right, hugging two sides of field to far field corner stile. Cross stile and ditch bridge then go diagonally left across field to hedge gap by large oak tree, then ahead to find field corner gate. Take gate and cross ditch bridge to driveway. Cross driveway and take kissing gate to left of gateway. Go left with hedge left to find and take field corner stile. Go right with hedge R to exit via field gap. After gap, go left with hedge left to field corner. Remain in field ( ignoring stile L ) and go right keeping hedge left passing under power lines to find field corner ditch bridge. Take ditch bridge and go with hedge left to take kissing gate to road. Go left on road for some 500 yards then turn right into Camp Farm / Pheasant Oak Farm. Go up driveway of farm through gateway and up centre between buildings to find large kissing gate (sometimes obscured by the parked caravans) in the very far left corner. (You will have to negotiate your way through a park of stored caravans to reach the kissing gate). Take the kissing gate then go ahead over field to go with hedge left and then stile to road. Cross road and go right for 30 paces to take large kissing left to enter field. Go diagonally half right over field to exit by far corner kissing gate to road. Go right on Old Waste Lane then take the driveway left, adjacent to a house named "Oaklands", some 40 paces before road end. After 70 paces continue through passageway to reach and take kissing gate into field. Go with hedge left to corner then go though metal kissing gate and over ditch bridge to maintain line with hedge left to hedge and kissing gate. Take kissing gate and continue with hedge left to corner field kissing gate. Take gate and steps up to disused railway, go slightly right then immediately left taking steps down to take kissing gate into short land strip to cross a ditch bridge. Go with hedge left to take bridge then kissing gate. Go ahead under power lines to take corner kissing gate then go ahead to rough driveway following around right and after some 50 paces take kissing gate right and go left across field to mid fence latch gate. Take latch gate and continue ahead to field corner, emerging onto drive via another latch gate. Turn right on driveway to reach road. Here we leave The Millennium Way and turn right on road eventually to reach a crossroads after some 500 yards. Continue over crossroads (signed Burton Green) and after a further 100 yards find kissing gate left. Take kissing gate and follow direction of waymark past a solitary tree ahead, to the right of a mound. After the tree ( on which you will see a waymarker ), go diagonally left. You are heading for the field corner kissing gate, with adjacent five bar gate ( but you may find the need first to go through a kissing gate inserted in an electric fence, if this is operational. )Take kissing gate ( or open gate ) then stay ahead, very gently uphill to reach two large metal gates ahead, located under power lines. Take the corner stile adjacent to the large gate on your left into field. Walk ahead more or less parallel to power lines for 200 yds to reach a waymark post. Here we need to turn right (there is a way marker on the wooden pen) and pass up field between the wooden pen left and a lone tree right. Keep ahead across the field aiming for the exit kissing gate just to the right of the house directly ahead. Take kissing gate and stay along driveway past houses to reach road. Turn right on road and shortly you will arrive back at your starting point. One of the oldest parts of the present parish of Burton Green is the area around Bockendon Grange and Westwood, though this was not considered part of Burton Green in Medieval times. Bockendon and Westwood were part of the Manor of Stoneleigh. 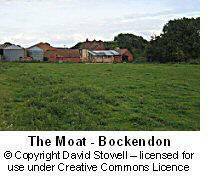 The name Bockendon is recorded from 1262. In the 1150s, Henry II gave land at Westwood Heath to the Cistercian Monks of Stoneleigh Abbey, for the purposes of farming and they established a farm at Bockendon Grange. Evidence of fish pools, created by the monks, still remains. The route for the proposed high speed rail line, HS2, from London to Birmingham will run right through the centre of Burton Green, making use of the disused rail route that is currently a Greenway. The residents of this close-knit and lively village are understandably devastated. The short stretch of line at Beechwood is the main Birmingham-Coventry-London route. This was the first inter-city line, engineered by Robert Stephenson in 1838.